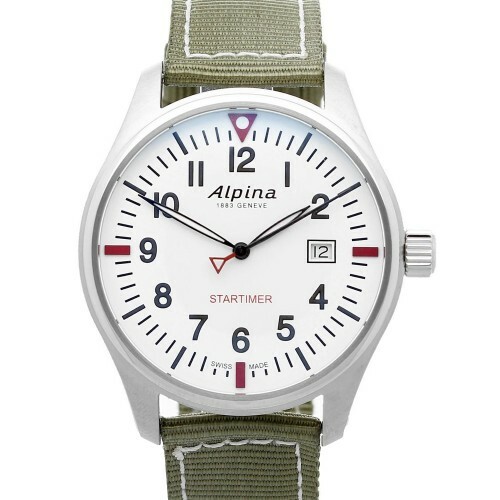 Cleanly styled, this Alpina Startimer Pilot Quartz Green Fabric Strap White Dial Men’s Watch (AL-240S4S6) pays direct homage to the Alpina timepieces of yesteryear, combining this retro feel with the very latest Swiss watchmaking technologies in the perfect blend of style and substance. The Alpina Startimer Pilot family features a collection of elegantly simple timepieces whose styling pays homage to Gottlieb Hauser’s original vision for the brand. In a nod to Alpina’s legacy as a supplier of watches to several elite air forces across the globe, the Startimer Pilot line is a modern re-imagining of the timeless aviator style watch, with this vintage styling given a thoroughly modern update at the hands of Alpina’s expert team of watchmakers at their manufacturing centre in Geneva.